Note:: Above price may vary as per customer requirement related to diameter and length and also depands on market situations. We are highly acclaimed in this industry for providing an optimum quality range of Multi Start Screw. Four bar Rotary cutter are widely used in corrugated box and paper industries. The cutters are manufactured from En-31 and H.C.H.Cr (D3). The cutters are fully guranteed for its durability and cutting life. All the products are variable according to sizes and quality.Minimum 500 pieces can be delivered. Banking on the skills of our qualified team of professionals, we are involved in presenting Lathe Machine Lead Screw. This Lathe Machine Lead Screw is highly appreciated amongst customers for its corrosion resistant nature. Our product range is used as a linkage in a machine. We are manufacturer, supplier and exporter Lead Screw, which is an integral part of any type of machine. The smooth nobility and the accuracy of the machine is largely dependent on the accurate functioning of the lead screw. 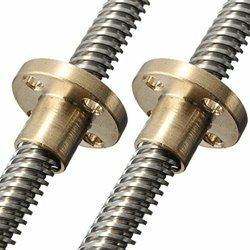 We make lead screw in all types of threads like acme, squarepezodial, metric, etc. Varun Tools & Components are manufacturer and supply a best quality Industrial Lead Screws. 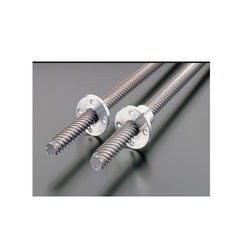 A Industrial Lead Screws is also known as a power screw or translation screw. - Heat treated to insure proper hardness on the pressure side (wear) and in the root of the thread (breakage). Trapezoidal screws are precision rolled. Continuous search for improvement and many years of experience in the development of the cold plastic deformation process which characterizes rolling allow us to offer our customers trapezoidal screws with excellent features.